What happens when the tourism industry invades places of worship? Ceasefire's Ruqaya Izzidien, writing from Cairo, discovered some of the answers. It was a heartbreaking conversation, but one that is increasingly unsurprising when visiting ‘Muslim’ countries. The prioritisation of tourism has led to social norms continuing unchallenged and a rise in antipathy towards religious rights. This particular incident occurred in a famous Cairo mosque and was repeated, almost word-for-word, a few hours later in another. I was told that women were free to walk around the mosque, but if they wanted to sit down, it must be in the “women’s room”. Simultaneously, a group of female tourists parked themselves in the ‘men’s’ mosque, and were left undisturbed. Putting aside the illogicality of being able to stroll through an area in which you are forbidden from sitting, there is a clear discrepancy between the rules laid out for worshippers and those for sightseers. The double standard is not simply restricted to places of worship; observant Muslims are often turned away at water parks in Kuala Lumpur for wearing loose clothing or even the ‘wrong’ material, regardless of its water resistance. In “elitist” hotels in the Middle East, you can be exiled from the swimming pool if your arms and legs aren’t on show. Presumably they don’t want burka babes tainting the water and the hotel’s image. Tourism is a valuable industry, both economically and socially. Visitors’ requirements should be accommodated by host countries, but this does not require the sacrifice of local residents and their beliefs. But in a bid to get ahead in the tourism rat-race, those who administer attractions tailor them to the needs of sightseers, while presenting ever-more challenges to Muslim residents and visitors. Many tourists who visit Muslim-majority countries perform tours of religious areas. Opportunists have developed an entire sub-culture of creating jobs where no tasks exist and therefore swindling money in exchange for… well, nothing. The call to prayer has just rung out, so you hasten to a mosque around the corner. As you slip off your shoes, a man beside the door tries to wrestle them from you to put them in his shoe rack. It is, conveniently, the only shoe rack in the entire building but you manage to make a break from his grip and hasten inside, shoes in hand, before he can say baksheesh. Unless I’m going bowling or you have some magical elves who are going to add a few pink bows to my boots, then I refuse to pay for you to put them on a shelf. Even those of us who have adapted to avoid this debt-collection, by arming ourselves with shoe bags, are given a guilt-inducing glare as the shoekeeper ominously taps his ‘donations’ box, should you dare to leave the mosque carrying your shoes. This is another example of how anti-Islamic practises – charging entry to a mosque- trump citizens’ rights if it results in more points for the tourism industry. When I was told that I had to scurry along to the ‘women’s house’, I decided to take the issue up with the resident sheikh. When I presented my complaint, it was not met with hostility, but with disorientated surprise. It was as though nobody had challenged the absurdity of a rule that allows you to stand but not sit. It made little difference; after some consultation and discussion, I was told by an unconvinced sheikh that the ruling was to be upheld. I pray (but only in the women’s room, obviously) that as Muslims, particularly in the Arab world, become reacquainted with their rights, more people will begin to question routines that are born out of tourism-induced religious stagnancy, rather than any basis in Islam. « Previous: North African Dispatches Will Assad survive? I live in Cairo and the issue shouldnt be about whether women can sit in the designated area for men but if the mosque provides a prayer area for women. 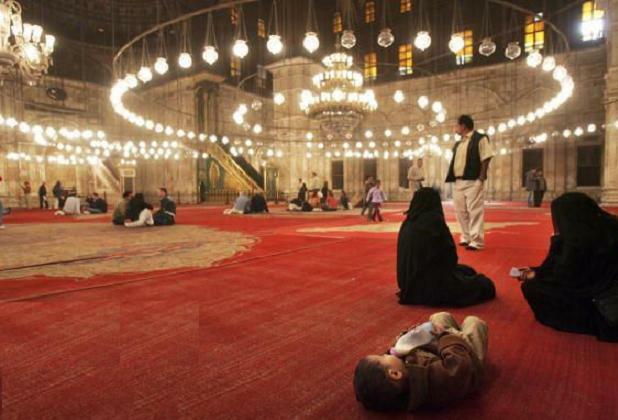 All the mosques in egypt do have a womens prayer area which is more than can be said for india or pakistan where i was directly told i couldnt go enter into a newly built mosque even though half the money spent to build it was probably provided for women. As a woman anyway why would you want to sit in a mans area? just as you wouldnt want a man to park himself in the womens area then the same can be said for the woman. But you’re right, something needs to be done about the practices that make a woman feel uncomfortable to enter a mosque. But in Cairo a woman is always welcomed. Thats my experience anyway. Just because a bad situation is better than another, it doesn’t make it good. Women have a right to pray in the mosque and although it is obviously a positive that any particular mosque might have a prayer area, it really shouldn’t be a marvel over which we pat people on the back and say job well done, without thinking about whether the needs are truly being met. It’s nto about men’s area VS women’s area. It’s about women being shoved in a room that smells like feet, while are restricted access to some of the most historic and wonderous mosques in the world. I want to be able to go and sit in the courtward and ‘absorb the atmosphere’ as one old lady who I met in Al Azhar put it.